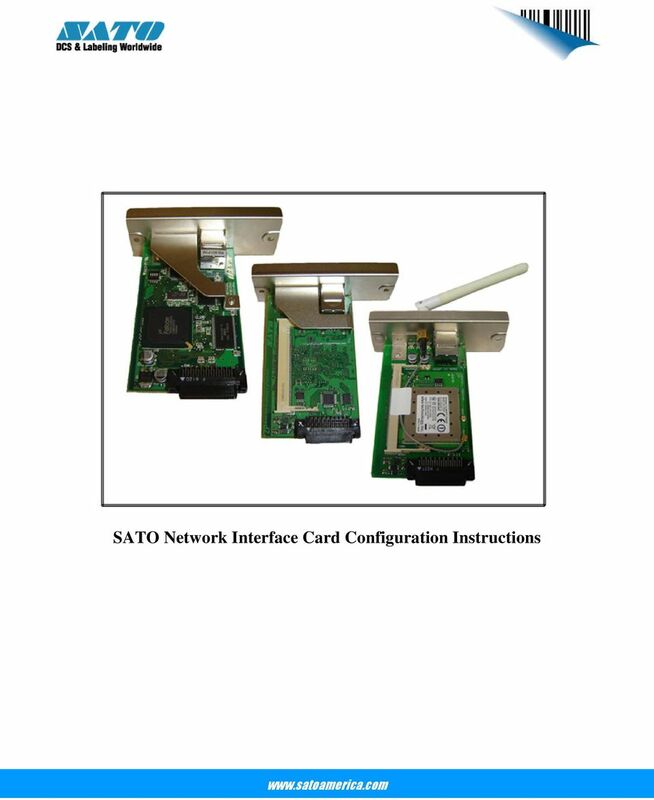 Download "SATO Network Interface Card Configuration Instructions"
3 1. Reset of wired/wireless interface card 1. If your printer is on, turn off your printer and remove the top and bottom screw holding the interface card in place on the back of the printer, you can then pull the interface card out of the printer. 2. On the interface card, you will be looking for 4 small dip switches. Turn dip switch number 2 on (away from the number), then reinstall the interface card on the back of the printer. You do not have to screw the top and bottom screws back in yet. 3. Turn the printer power on and wait for about 30 seconds. After 30 seconds, turn the power off on the printer and pull the interface card back out. Turn dip switch number 2 on the interface card back down and re-insert the card into the printer. You can now put the top and bottom screw back into the printer that holds the interface card in place. 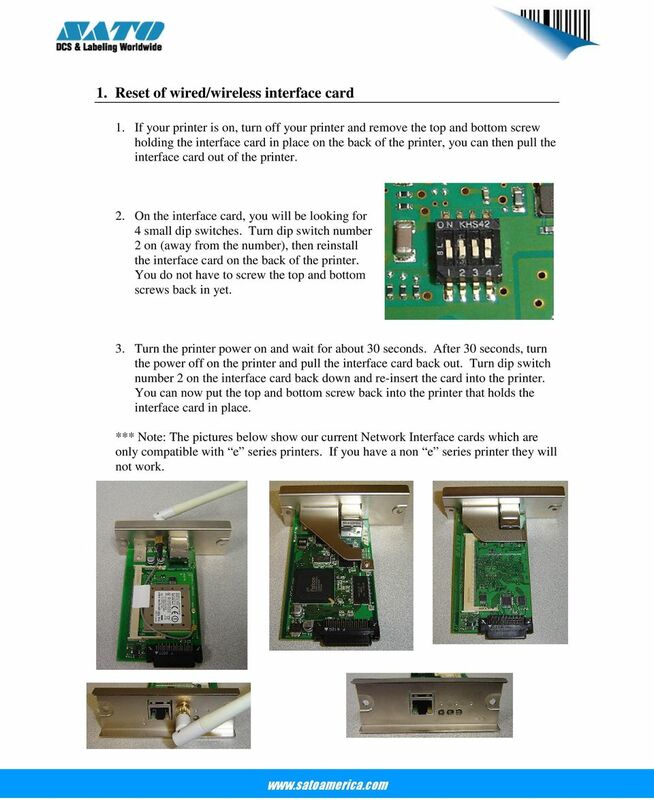 *** Note: The pictures below show our current Network Interface cards which are only compatible with e series printers. If you have a non e series printer they will not work. 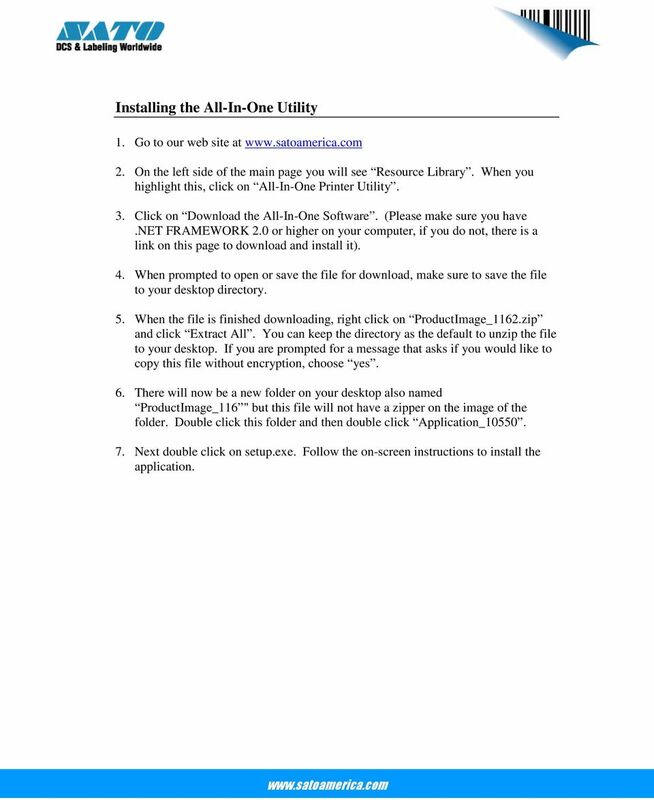 4 Installing the All-In-One Utility 1. Go to our web site at 2. On the left side of the main page you will see Resource Library. When you highlight this, click on All-In-One Printer Utility. 3. Click on Download the All-In-One Software. (Please make sure you have.net FRAMEWORK 2.0 or higher on your computer, if you do not, there is a link on this page to download and install it). 4. When prompted to open or save the file for download, make sure to save the file to your desktop directory. 5. When the file is finished downloading, right click on ProductImage_1162.zip and click Extract All. You can keep the directory as the default to unzip the file to your desktop. If you are prompted for a message that asks if you would like to copy this file without encryption, choose yes. 6. There will now be a new folder on your desktop also named ProductImage_116 " but this file will not have a zipper on the image of the folder. Double click this folder and then double click Application_ Next double click on setup.exe. Follow the on-screen instructions to install the application. 5 Configuring wired/wireless Ethernet with All-In-One Utility 1. If your card has been previously configured or you would like to start from scratch to configure the card, follow the Reset of wired/wireless interface card procedure on page 3 before continuing. 2. 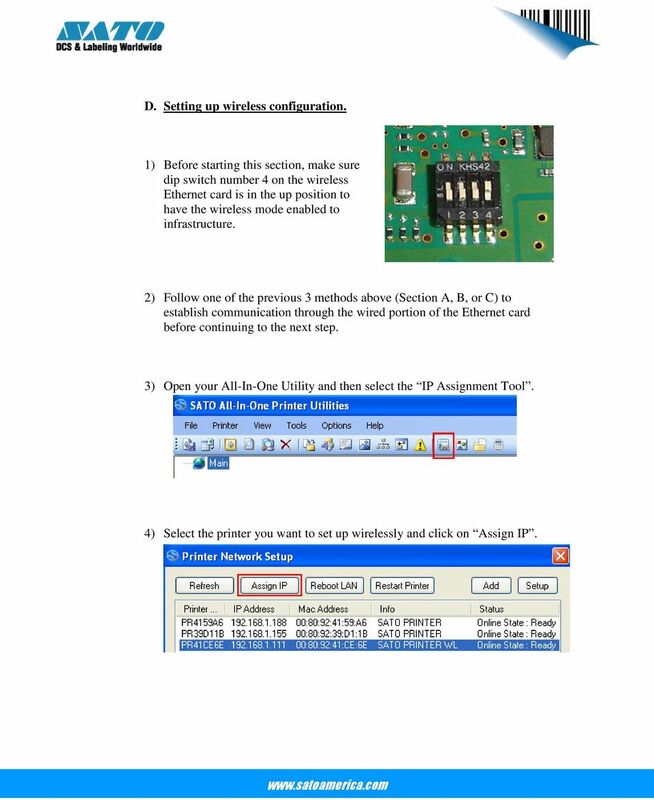 There are three different methods for configuring a wired Ethernet interface card for our printer. (A) Connection direct from PC/laptop to printer with a cross over cable. (B) Connection over a network. (C) Connection through a switch or hub. A. Direct connection with cross-over cable. 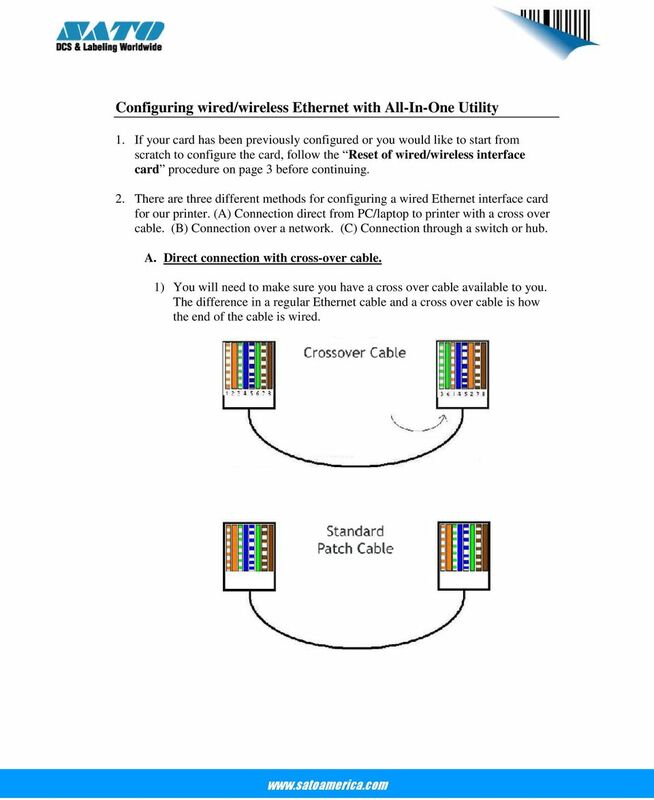 1) You will need to make sure you have a cross over cable available to you. The difference in a regular Ethernet cable and a cross over cable is how the end of the cable is wired. 6 2) Connect one end of your cross over cable to the PC or Laptop and the other end in the back of the printer. (Do not turn the printer on yet). 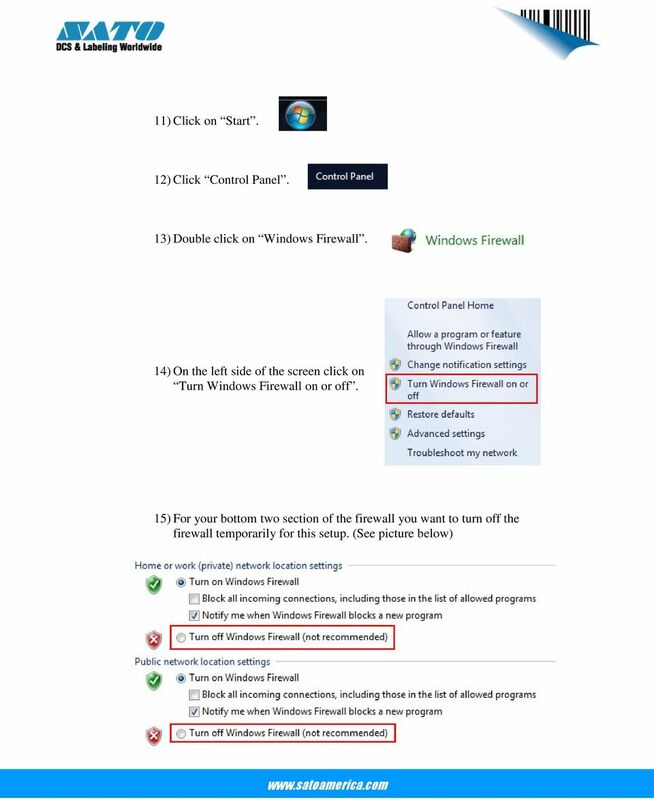 3) The next couple steps will describe configuration of your computer for a static IP address, these steps are based on Windows 7. 4) Click on Start. 5) Click Control Panel. 6) Double click on Network and Sharing Center. 7) On the left side of the screen click on Change adapter settings 8) Right Click on Local Area Connection and then click Properties. 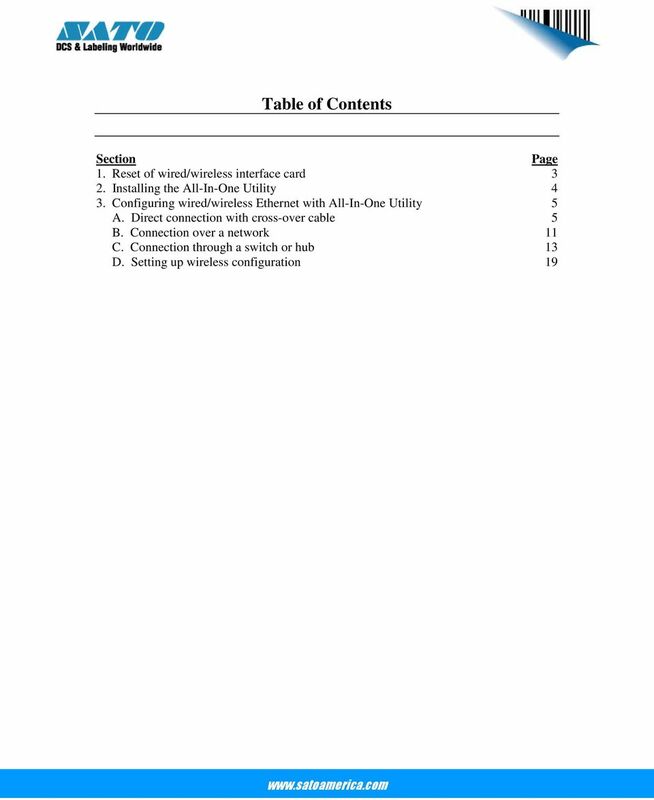 7 9) Scroll down the list of connections and click on Internet Protocol Version 4 and then click on Properties. 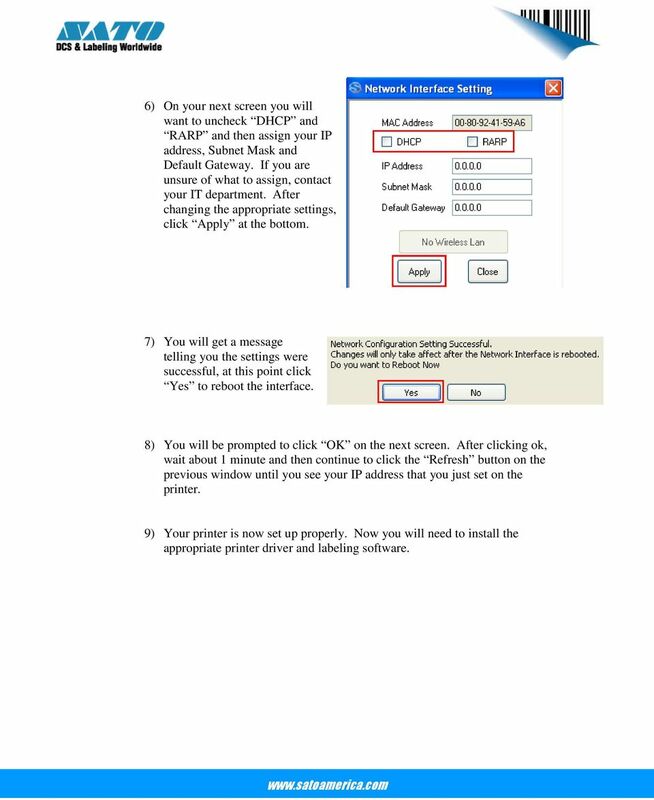 10) Choose the option for Use the following IP address: and assign your computer with an IP address within the same range of what you want to assign to the printer. For example, if you are setting your printer to you will want to use an IP address that has the last octet off by one number like in the picture to the right. Your subnet mask will be based upon your IP address. If you need a list of appropriate subnet masks based upon your IP address you may need to consult your IT department or look up what the subnet mask you need to have based upon your IP address on the internet. 10 18) On your next screen you will want to uncheck DHCP and RARP and then assign your IP address, Subnet Mask and Default Gateway. If you are unsure of what to assign, contact your IT department. After changing the appropriate settings, click Apply at the bottom. 19) You will get a message telling you the settings were successful, at this point click Yes to reboot the interface. 20) You will be prompted to click OK on the next screen. After clicking ok, wait about 1 minute and then continue to click the Refresh button on the previous window until you see your IP address that you just set on the printer. 21) Your printer is now set up properly. If you are keeping the computer hooked up permanently this way, you will just need to install your printer driver and labeling software package to start printing. If the printer is being put on a network, just turn the power on the printer off and use a regular Ethernet cable to connect the printer to your network. 11 B. Connection over a network. 1) Before starting this configuration over a network please be aware that different network are set up with different levels of security. If this process fails, please revert to Section A (Direct connection with cross-over cable) to eliminate the possibility of the security on the network causing issues with set up of the interface card. 2) If your card has been previously configured or you would like to start from scratch to configure the card, follow the Reset of wired/wireless interface card procedure on page 3 before continuing. 3) Make sure you have a regular Ethernet cable hooked up from your network to your printer and power on your printer. Your computer will also need to be connected to the same network as the printer. 4) Open your ALL IN ONE Application (Click Start, Programs, SATO, and then SATO All-In-One Application ). Once open you will want to click the shortcut key for IP Assignment tool. (Shortcut key indicated by the red box). 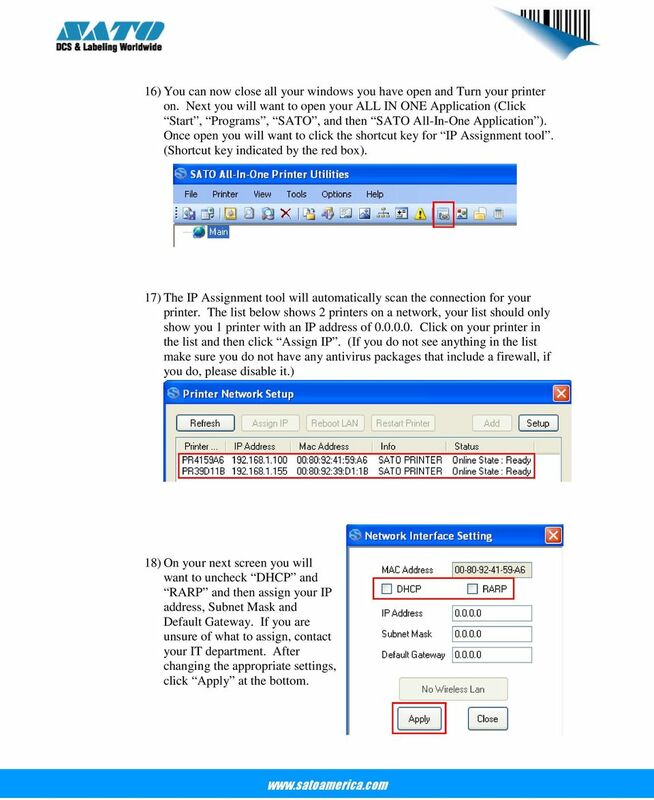 5) The IP Assignment tool will automatically scan the network for your printer. The list below shows 2 printers on a network. 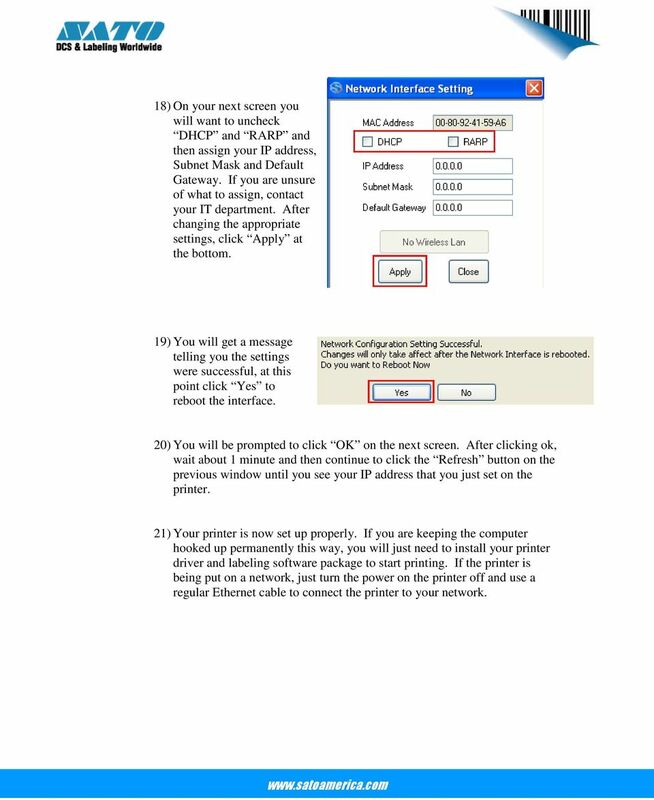 Click on the printer in the list and then click Assign IP if you want to set a static address to it. If you want to keep the network card on DHCP then just record the IP address so you can set it up in your printer driver. 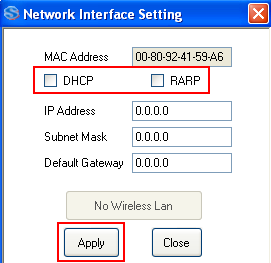 12 6) On your next screen you will want to uncheck DHCP and RARP and then assign your IP address, Subnet Mask and Default Gateway. If you are unsure of what to assign, contact your IT department. After changing the appropriate settings, click Apply at the bottom. 7) You will get a message telling you the settings were successful, at this point click Yes to reboot the interface. 8) You will be prompted to click OK on the next screen. After clicking ok, wait about 1 minute and then continue to click the Refresh button on the previous window until you see your IP address that you just set on the printer. 9) Your printer is now set up properly. Now you will need to install the appropriate printer driver and labeling software. 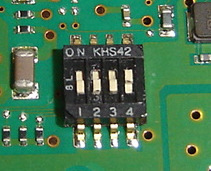 13 C. Connection through a switch or hub. 1) If your card has been previously configured or you would like to start from scratch to configure the card, follow the Reset of wired/wireless interface card procedure on page 3 before continuing. 2) You will need to have a switch, hub, or router to act as a switch as well as 2 regular Ethernet cables. Hook one Ethernet cable from your hub/switch to your printer, and another Ethernet cable from a different port in your hub/switch to your PC. 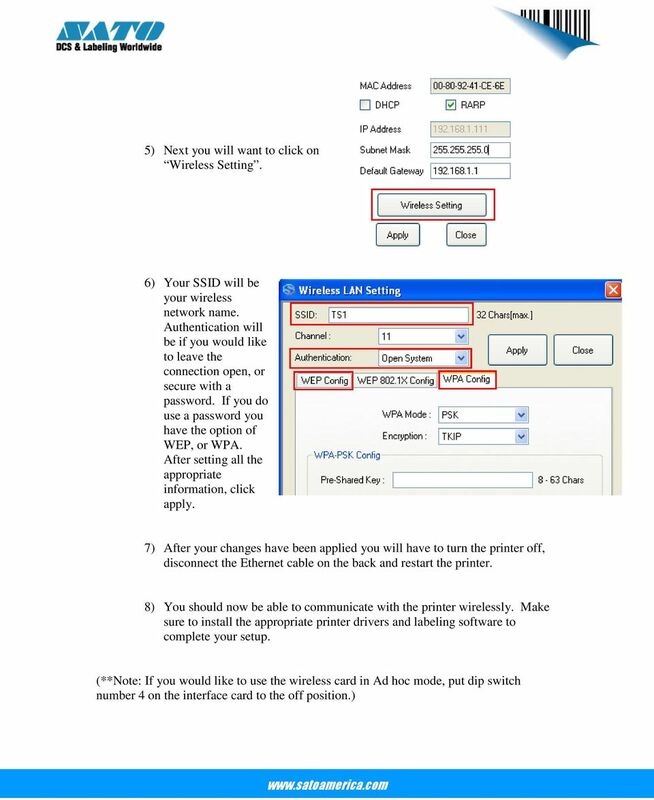 3) The next couple steps will describe configuration of your computer for a static IP address, these steps are based on Windows 7. 4) Click on Start. 5) Click Control Panel. 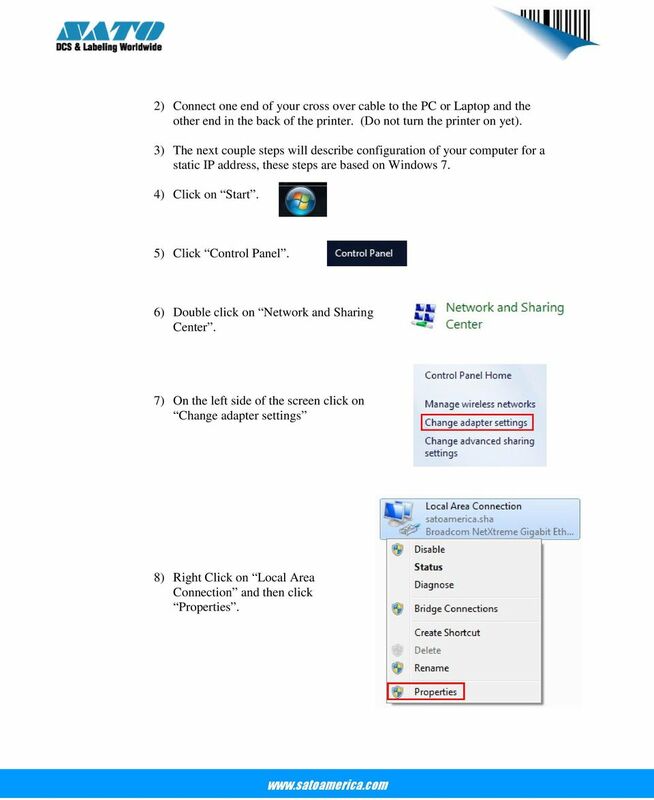 6) Double click on Network and Sharing Center. 7) On the left side of the screen click on Change adapter settings. 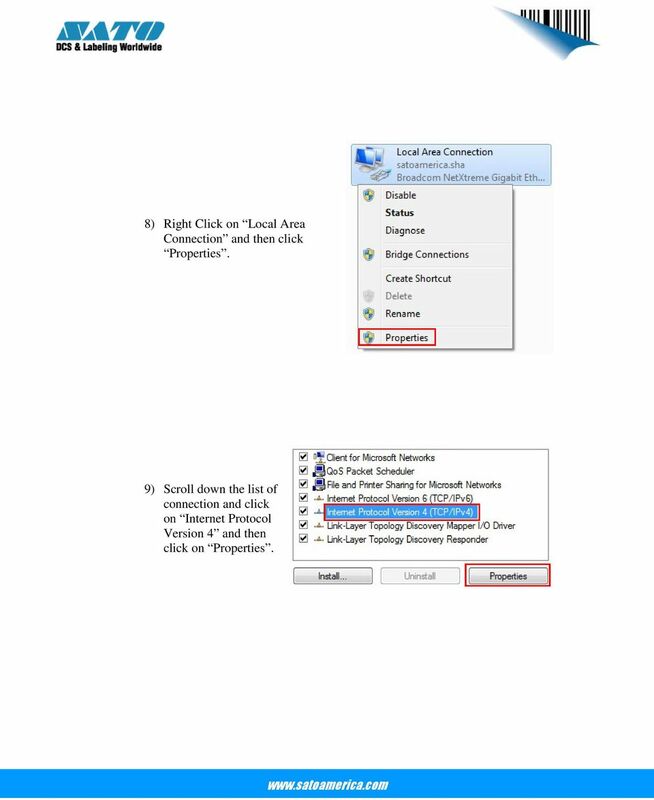 14 8) Right Click on Local Area Connection and then click Properties. 9) Scroll down the list of connection and click on Internet Protocol Version 4 and then click on Properties. 15 10) Choose the option for Use the following IP address: and assign your computer with an IP address within the same range of what you want to assign to the printer. For example, if you are setting your printer to you will want to use an IP address that has the last octet off by one number like in the picture to the right. Your subnet mask will be based upon your IP address. If you need a list for the appropriate subnet masks based upon your IP address you may need to consult your IT department or look up what the subnet mask you need to have based upon your IP address on the internet. 11) Click on Start. 12) Click Control Panel. 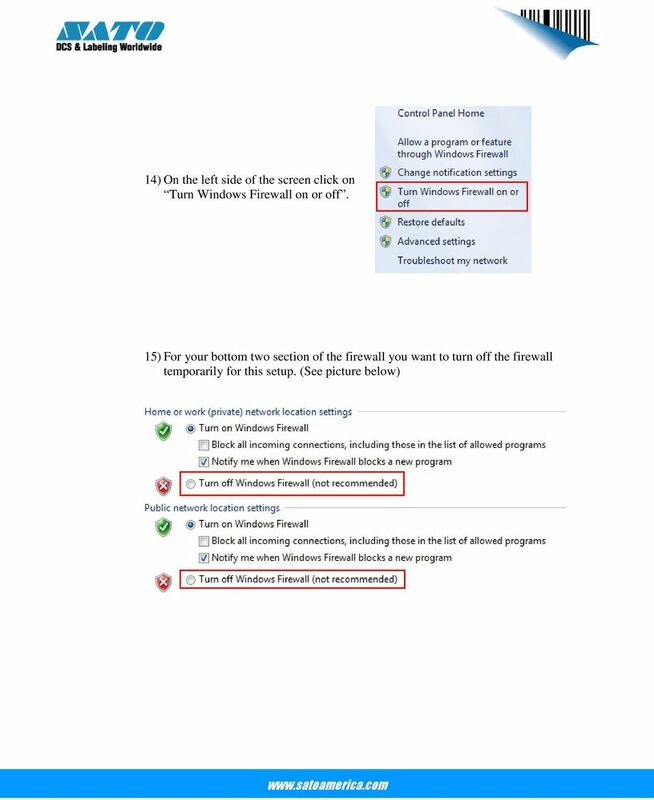 13) Double click on Windows Firewall. 17 16) You can now close all your windows you have open and Turn your printer on. Next you will want to open your ALL IN ONE Application (Click Start, Programs, SATO, and then SATO All-In-One Application ). Once open you will want to click the shortcut key for IP Assignment tool. (Shortcut key indicated by the red box). 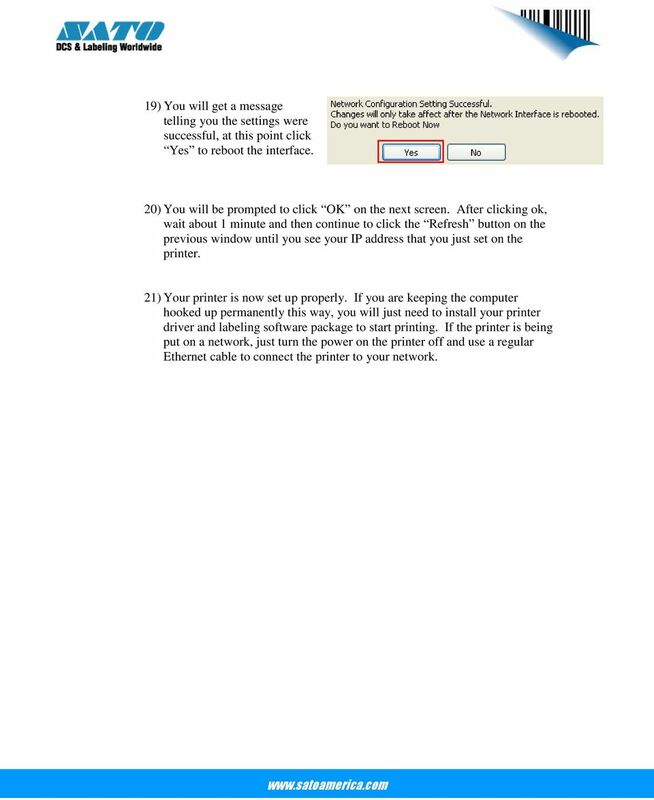 17) The IP Assignment tool will automatically scan the connection for your printer. The list below shows 2 printers on a network, your list should only show you 1 printer with an IP address of Click on your printer in the list and then click Assign IP. (If you do not see anything in the list make sure you do not have any antivirus packages that include a firewall, if you do, please disable it.) 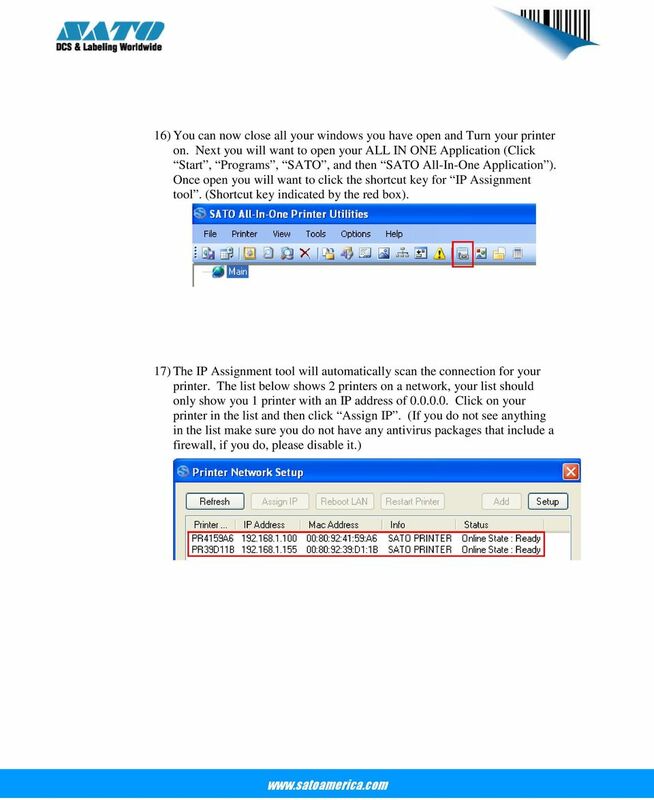 18) On your next screen you will want to uncheck DHCP and RARP and then assign your IP address, Subnet Mask and Default Gateway. If you are unsure of what to assign, contact your IT department. After changing the appropriate settings, click Apply at the bottom. 18 19) You will get a message telling you the settings were successful, at this point click Yes to reboot the interface. 20) You will be prompted to click OK on the next screen. After clicking ok, wait about 1 minute and then continue to click the Refresh button on the previous window until you see your IP address that you just set on the printer. 21) Your printer is now set up properly. If you are keeping the computer hooked up permanently this way, you will just need to install your printer driver and labeling software package to start printing. If the printer is being put on a network, just turn the power on the printer off and use a regular Ethernet cable to connect the printer to your network. 19 D. Setting up wireless configuration. 1) Before starting this section, make sure dip switch number 4 on the wireless Ethernet card is in the up position to have the wireless mode enabled to infrastructure. 2) Follow one of the previous 3 methods above (Section A, B, or C) to establish communication through the wired portion of the Ethernet card before continuing to the next step. 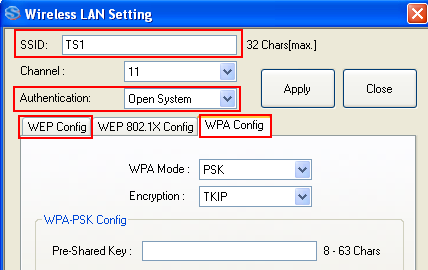 3) Open your All-In-One Utility and then select the IP Assignment Tool. 4) Select the printer you want to set up wirelessly and click on Assign IP. By using an access point (such as a wireless router), computers and printers can communicate wirelessly. Connection Guide. WiFi Signature Pads. Copyright Topaz Systems Inc. All rights reserved.